It may be smaller in size but one thing is for sure, Tso Moriri is no lesser in beauty than Pangong Tso. It has always been overshadowed by its bigger sibling but Tso Moriri is a wonder in itself. In fact, in my opinion, with the entire boost in tourism in Ladakh, Pangong has started to get crowded a lot because everyone goes that way. For someone who would rather spend some time in peace and serenity while enjoying the same kind of natural beauty, Tso Moriri is definitely a much better bet. If visiting this beautiful lake was on your Ladakh itinerary for this year, and you were traveling by public transport; then below is the schedule of Leh to Tso Moriri bus service for the year 2019. 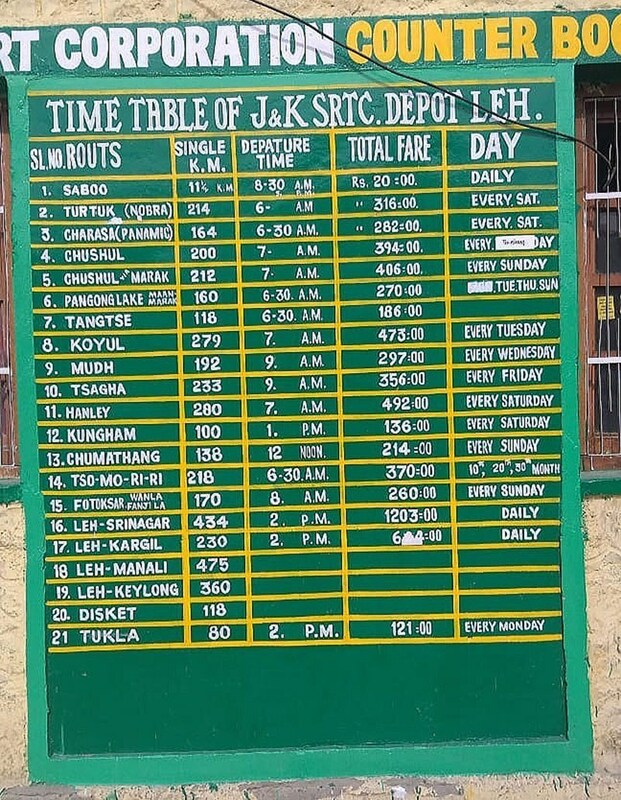 The image below was clicked at Leh Bus stand by a friend a couple of weeks ago and in fact, shows the entire schedule of buses running from Leh town to other parts of Ladakh. In this article, however, I will highlight the buses that you can use to travel specifically to and from the village of Karzok, where Tso Moriri is located. I will also provide details on alternate modes of transport if the timing and schedule of the Bus did not match your itinerary. Being a freshwater lake, Tso Moriri also supports the local wildlife and its water gets used for irrigation purpose as well. So you will get to see plenty of greenery around the lake which definitely is not the case with Pangong because that one is a saltwater lake. What’s more? If you were lucky enough, you may even get to spot some wildlife around Tso Moriri. For someone interested in bird gazing, you will definitely love your time here. The post below only details Leh to Tso Moriri Bus service that you can avail after you have arrived in Leh. I am not including details here on you can reach Ladakh. If you want to get details on that as well, then I recommend you to please take a look at How to Reach Ladakh – A Complete Travel Guide. Once you have arrived in Leh either by public transport or flight, then how you can travel from Leh to Pangong Lake by Bus is what I will be discussing in this article. I am not sure why it is this way but frequency of Buses between Leh and Tso Moriri is severely limited; and it has been this way for last 10 years at least. Tourism in Ladakh has increased tremendously in last few years; and along with it, local connectivity and availability of basic facilities too have improved several folds. One thing that however has not changed and still remains the same is the Bus that runs from Leh to Tso Moriri and Back. In total, there are three buses in the entire month that travel from Leh to Tso Moriri. These buses are scheduled every 10th, 20th and 30th day of the month. The bus leaves at 6.30 AM on these dates from Leh bus stand and arrives at its destination in the afternoon. So if you wanted to travel to Tso Moriri by Bus, you will have to draft your itinerary in a way that your journey falls on either of these dates only. The same bus that arrives from Leh at Tso Moriri on 10th, 20th or 30th will travel back to Leh the next day. So for your return journey, you can in fact board the same bus on 11th, 21st or 31st (1st of the following month). Total fare of the Bus from Leh to Tso Moriri is Rs. 370 per person and the same charge applies for the return journey as well. So, for a round trip from Leh to Tso Moriri and back, you will pay a total of Rs. 740 per person as Bus fare. Chumathang is a small village which kind of is the midpoint between Leh and Tso Moriri. It is not really the midpoint in terms of distance but can be called that in terms of time taken. Leh to Chumathang is about 140 kilometers total and will take you 2 to 3 hours to complete. Chumathang to Tso Moriri is another 80 kilometers but due to bad roads, will take you another 3 hours to finish. There is a Bus from Leh to Chumathang every Sunday which too can be used for reaching Tso Moriri. It starts from Leh at 12 noon and reaches Chumathang at around 3 PM. Fare per person is Rs. 214. Once you get to Chumathang, you will then have to look for an alternate mode of transport which in all probability will be hitchhiking. There is a small guest house at Chumathang so if you did not find a way to get to Karzok that day; you can stay at Chumathang itself for the night. The best way to reach Tso Moriri, however, would be a shared taxi. These shared cabs start from Leh Bus stand every morning between 6 to 8 AM and will drop you at Karzok by afternoon. Per person charge for the cab will be between Rs. 400 to Rs. 500. For return journey as well, you can catch a shared cab from Karzok and reach Leh by afternoon. There is no booking system available for the Bus. You will reach the Bus stand, board the Bus and buy a ticket. For shared cabs as well, you do not need to book and find one on the spot. The Buses on this route are the ordinary JKSRTC ones but comfortable enough for a few hours of journey. The shared cabs are mostly a Sumo, Bolero or Xylo. The journey is pretty much a straight forward one and neither the Bus nor the shared cab will stop on the way for sightseeing. Also, Karzok is the village on the banks of Tso Moriri so keep an eye out for a Bus or shared cab for either Tso Moriri or Karzok. I hope the information above on Leh to Tso Moriri Bus Service 2019 was of help. If you have any questions; or need any other details; please feel free to ask in the comments section below; or at our Community Forum; and I will be glad to answer. Can I hire a bike from leh to tso moriri?what is the road condition? What measures should I take if I plan to go by bike? Also please let me know about the accommodation facilities there.